Blog posts and online actions from previous years. Ashy: Blogging for ME Awareness Day 2009! 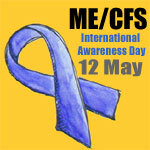 Shelli/Living the CFS Life: Kicking Off ME/CFS Awareness Week! Paul Groves – Controversial, ME? Whatever could you mean? RachelCreative – What is ME/CFS? Make-Up « Blue Coffee Mug on What Next? Rachel M on What Next?